The mission of Celeritas Publishing is to bring readers important new books on the topic of product development. 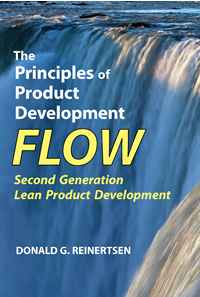 We are very pleased to announce the publication of the latest work by Donald Reinertsen, The Principles of Product Development Flow: Second Generation Lean Product Development. Donald Reinertsen’s previous works are Managing the Design Factory, and Developing Products in Half the Time. They placed #2 and #7 on the IEEE Engineering Management Great Books List. The top-rated book on this list was by Peter Drucker.